Home » VectorVest » Buy Northern Bear #NTBR says VectorVest. Opportunity for near term gains backed by bullish price action and fundamentals. 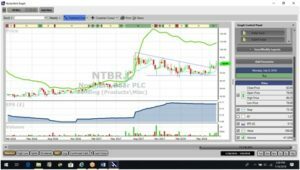 Buy Northern Bear #NTBR says VectorVest. Opportunity for near term gains backed by bullish price action and fundamentals. By Alan Green in VectorVest on 17th July 2018 . Newcastle-based Northern Bear (NTBR.L) is a provider of specialist building services. The company was floated on AIM in December 2006, and provides services ranging from general building work, fire protection, roofing works, fork lift truck sales/hire and health and safety consultancy. There are currently 11 businesses in the group which together employ over 300 people. VectorVest valuation metrics for NTBR had occasionally flickered into life in early 2018, but it was the run up to the June trading update that saw the RT (Relative Timing) metric, (a fast, smart, accurate indicator of a stock’s price trend), flag up an opportunity. Now in mid July, despite a bullish move higher in the share price, the NTBR RT metric still logs 1.27, which is rated as very good on a scale of 0.00 – 2.00. Other high scoring metrics include a GRT (Earnings Growth Rate) of 19%, which VectorVest also considers very good. The stock continues to add gains, but even at 82p, VectorVest believes the stock is still underperforming against a valuation of 108p. 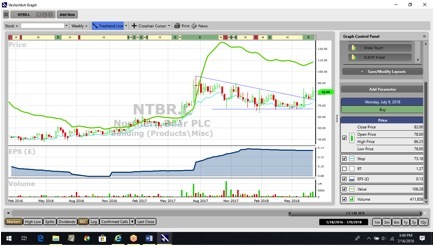 A weekly chart of NTBR.L is shown above in my normal format. After a strongly trending upward move, in the first seven months of 2017, the share has traded sideways to down. Chartists refer to this type of pattern as a continuation pattern. Recently the share has broken the trendline defining the highs of the continuation pattern on rising volume. This is very bullish price action and bodes well for a push to at least the last high made on August 2017. Summary: With over 85% of NTBR turnover coming from repeat business, its management can rightly be praised for a discerning approach to finding and bedding in quality acquisitions. Income investors will note that NTBR offers regular dividend payments, but with Exec Chairman Steve Roberts bullish over forward prospects for the group, VectorVest also sees an opportunity for near term capital gains. We rate the stock as buy, with a price target of 108p.